Items will be despatched once payment has cleared and most should arrive within 7 working days. 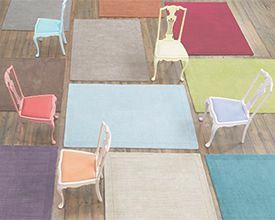 Love-Rugs offer free UK mainland delivery on orders over £150. Orders under this value will be charged at a flat rate of £9.95. Please contact us for offshore isles, highlands and islands, Norhern Ireland or international shipping fees. If you require your rug to be with you on a certain date or by a certain time please contact us before purchase in order to allow us to organise, if possible. Additional fees apply for pre-12, pre-10am and Saturday deliveries, if available. For whatever reason if you want to return your rug(s) you must inform us of your desire to return them by email was soon as possible and within 48 hours of delivery. The rug(s) must be returned to our store in original condition and within 14 days for a refund to be given. On return of the rug(s) and inspection we will refund your purchase minus any shipping costs. If when you receive your rug it is damaged or faulty you will be granted a full refund including shipping charges, or a replacement can be sent and the damaged rug collected. If there has been damage to the packaging of the rug, photographs must be taken of the packaging damage prior to opening and this must be reported immediately and mentioned to the driver. Please note: custom and tailor-made rugs are non-refundable under the Consumer Contracts Regulations unless made with significant error. If you do not wish to receive or keep your custom order we will accept the rug back in its original condition and refund the cost minus the initial 1/3rd deposit. We are unable to refund any rug which contains names, dates or personal details of any kind. If you are able to pick the rug or rugs up you are welcome to do so from our store.